Reconfigure OSPF authentication between R1 and R2. Use the password 'G33K' and the most secure option to accomplish this. Do not change Simple Password authentication configured on the remaining routers (configured in the previous lab). When MD5 authentication is enabled, what should match between routers in order to establish FULL adjacency? What is the order of operations if OSPF authentication method is configured in the routing context and on an interface? 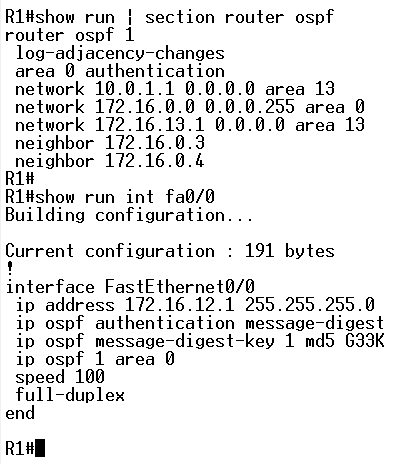 Notice, that R1 shows as FULL state OSPF neighbor and R2's routing table has been populated again. Also, take a look at pic. 3. The last two line show that key 1 and MD5 method has been used. In OSPF MD5 authentication method, you can change passwords by adding an extra key with the new password. If you do so, there is no interruption in the service (you will see it in the next lab). 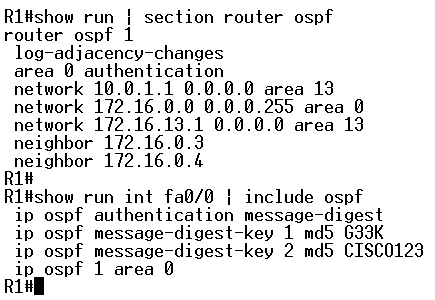 While using OSPF MD5 authentication, both 'key number' and the 'password' between routers must be identical in order to establish FULL state between neighbors. Experiment by changing the 'key number' on R2 (and leaving key=1 on R1). Use 'debug ip ospf adj' to see the result of that change. Then, configure the key=1 on R2 back again, but change the password instead. Observe the output of the debug. Find the differences between the two dubug output. Enable OSPF area 0 between R1 and R2 on their FastEthernet interfaces (refer to pic.1). Enable OSPF Simple Password authentication in area 0. 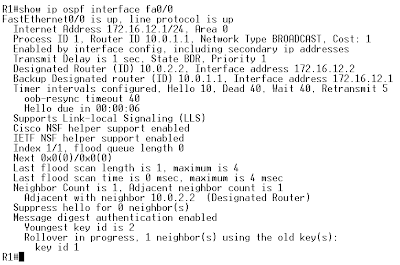 Configure R1 to use this authentication methods in the 'router ospf' context. R2, R3, and R4 should have their authentication enabled on their respective interfaces. Use the password 'G33K' on all routers. What is the purpose of authenticating routing packets? What are the OSPF authentication methods? What are the methods of implementing OSPF authentication? All R1's neighbors are back. The last line of Se0/0 says: Simple password authentication enabled. All other routers show the same on their respective interfaces. Simple password method is very insecure since the password is sent in a clear text format. MD5 uses hashing algorithm and allows easy password changes without any interruption (presented in later lab). Both authentication methods can be enabled in router context or on an interface. On R1, R3, and R4 disable pseudo-broadcast on Frame-Relay interfaces. Reconfigure OSPF on R1, R3, and R4 to use OSPF point-to-multipoint non-broadcast mode. Ensure OSPF domain has full connectivity. What happened when you have removed 'broadcast' keyword in Task 1 as far as OSPF communication? What is/are the difference(s) between OSPF point-to-multipoint and point-to-multipoint non-broadcast? Is the mode used in this lab Cisco proprietary or RFC standard? If you cannot use pseudo-broadcast (for instance, this is an exam stipulation)on NBMA links (or there is no support for), you can use OSPF point-to-multipoint non-broadcast mode. This will behave just like OSPF point-to-multipoint (treats connections as point-to point, no DR/BDR election). This mode of OSPF is Cisco proprietary. The timers are 30/120 seconds (hello, dead). 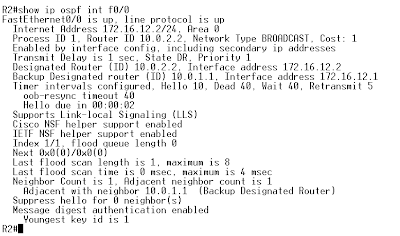 Since this mode does not assume pseudo broadcast/multicast support, it requires the 'neighbor' statement in the configuration on R1 (the hub router). The spoke routers will respond using unicast upon receiving unicast hello. 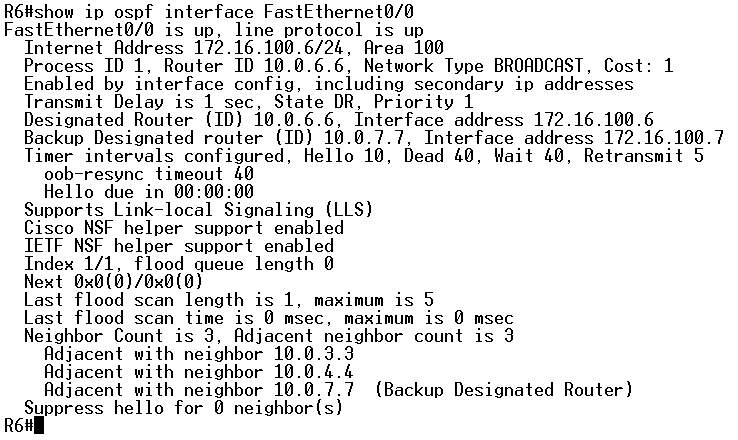 As for the next-hop address, this option also behaves like OSPF point-to-multipoint mode. Reconfigure R3 and R4 Frame-Relay connection in such a way that there is NO spoke-to-spoke IP-to-DLCI mapping. On the spoke routers (R3, and R4) configure IP-to-DLCI mapping towards R1 (hub routers) and its own IP address. 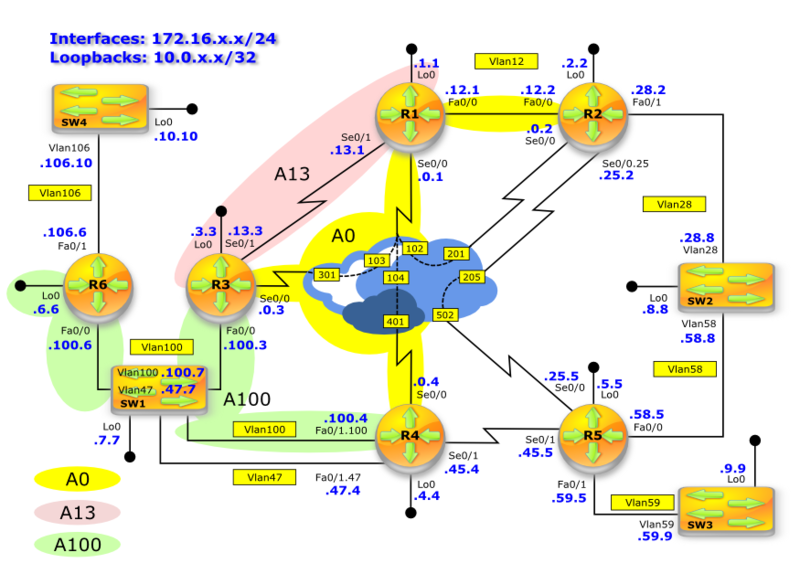 You need to reconfigure OSPF on Frame-Relay connection between R1, R3 and R4. Ensure that the OSPF routing table on R3 and R4 shows R1 (172.16.0.1) as the next hop to networks learned from the other spoke over Frame-Relay connection. Ensure that multicast (224.0.0.5) is supported and there is no DR/BDR election there. What is the mode of OSPF best to support the stipulations in Task 2? What needs to be done in terms of Frame-Relay configuration to support it? What are the principles of operation regarding the solution provided (DR/BDR election, timers, multicast support)? Why did I use 'broadcast' keyword even though task 1 did not imply using it? The reason is that task 2 will need the support of pseudo-broadcast/multicast (224.0.0.5 must be supported). Why did I remove OSPF priority 0 from R3 and R4? 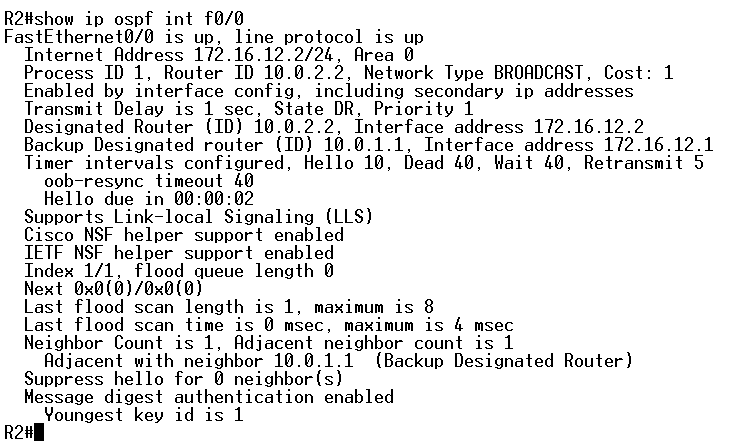 OSPF mode used in task 2 (Point-to-Multipoint) does NOT elect DR/BDR since it treats the connections like point-to-point. This configuration is not required anymore. Since all serial0/0 interfaces in question have already been OSPF-enabled (ip ospf 1 area), all that is required is to remove 'neighbor' statement on R1 (unicast is no longer required in OSPF point-to-multipoint mode. Second thing to configure is to enable appropriate ospf mode. Neighbor relationship between R1 and its spokes (R3, R4) shows state: FULL. Notice, there is no DR/BDR information (-) since this mode does not elect DR/BDR. Similar relationship should be present on the spokes with R1. R1, R2, and R3 should show State POINT_TO_MULTIPOINT on their serial0/0 interfaces. Pay attention to the Hello and Dead timers (30/120) respectively. 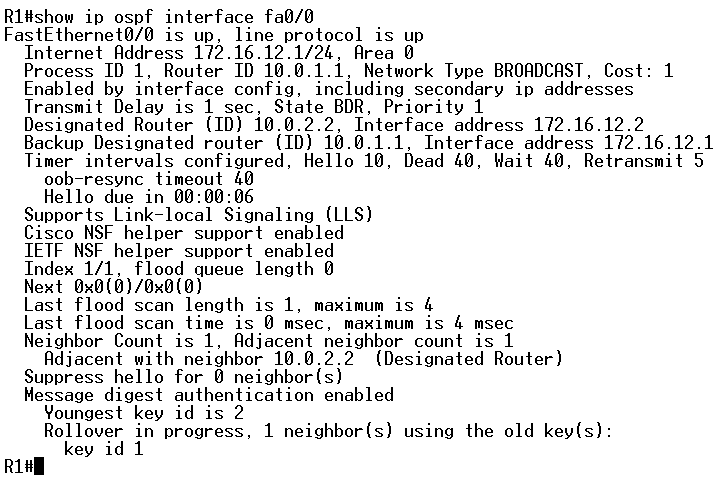 OSPF Point-to-Multipoint (RFC-based, not Cisco proprietary) treats the neighbors just like point-to-point connection (except for timers since p2p uses 10/40). Much like point-to-point, OSPF expects multicast support (Frame-Relay pseudo 'broadcast' while configuring IP-to-DLCI mapping). Also, consider that 224.0.0.5 (in fact the whole range 224.0.0.1-224.0.0.255) is link-local multicast. This means that spoke-to-spoke 'hello' would never get across R1 since the packet uses TTL=1. The communication between spokes will need to cross R1, which gives its own IP address (here: 172.16.0.1) as the next hop while advertising prefixes advertised from one spoke towards another spoke. The communication between R3 and R4 prefixes will work across R1 even though there is no IP-to-DLCI spoke-to-spoke mappings because the next hop is always hub router now. Configure R3 to be the DR and R4 to be BDR in Vlan 100. Do not shut down any interface, reload any of the devices or clear OSPF process on any device to accomplish this. What is the role of DR/BDR in the broadcast and NBMA networks? 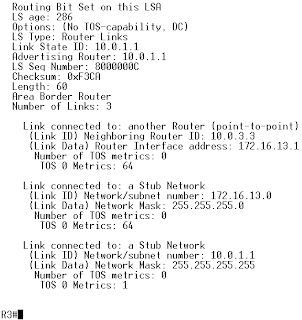 What are the pre-requisites to make a router eligible to become DR/BDR? What is the order of operations when it comes to DR/BDR election? In the previous lab we have configured R1 to be elected the DR in the Frame-Relay hub-ans-spoke network. We made sure that neither of the spokes became the BDR. Can you explain why? Before we start the configuration, let's see what the current state of things regarding DR/BDR in Vlan 100 is. Do not worry if your output is different. Take a look at pic. 2. Here's an interesting question for you: based on what Pic.2 represents, would you be able to tell which device is the DR and which is the BDR in Vlan 100 (FastEthernet0/0 interface)? Stop reading now, and give it a shot! If you can't answer the questions, read on! The 5th line of the output says: State DR.
Now, recall that the purpose of DR/BDR roles in broadcast and NBMA network is to reduce the number of LSA exchanges. The exchanges must happen between all neighbors in FULL state. In the aforementioned networks, FULL adjacency is built only with DR/BDR, so DR becomes the only representative to send update on behalf of other routers. Both DR, and its sidekick, BDR must have layer 2 connectivity to all OSPF enabled routers in the same broadcast/NBMA network. If the routers are in the same Vlan this is not a problem. But consider Frame-Relay hub-and-spoke topology in which there is not layer 2 PVC provisioned between spokes. In such situation only the hub router can become DR (has layer 2 connectivity with all other routers) and spokes should never become BDR. We will take a closer look at this after we have solved the problem presented in the task 1. In case of a tie (the same priority), prefer the highest OSPF router ID. Now, let's configure the solution. Now, in order to create re-election, as per the stipulation, I will make R6, R4 and SW1 temporarily ineligible of becoming DR/BDR by introducing OSPF priority 0 on their respective interfaces, and then after few seconds bringing the default priority of 1 on them. Now, let's put thing back to where they should be. Let's tinker with Frame-Relay network and the problem of just having DR (R1) with no BDR. Let's leave the election of DR/BDR without interfering (all routers have default OSPF priority 1). Shut the interfaces down and bring them back up. After the interfaces have been brought up the DR is R4 (10.0.4.4) and BDR is R1 (10.0.1.1). In order to see this just give it a moment. 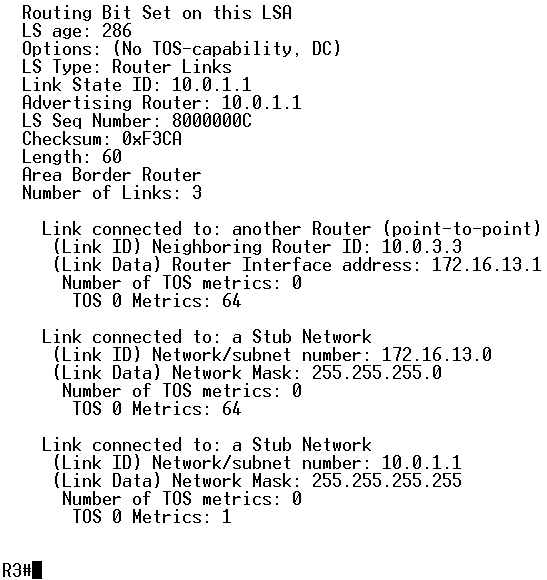 It is apparent that Stub Network 10.0.1.1/32 has been learned from R1 (Advertising Router: 10.0.1.1). It is easy to predict what is going to happen if I shut the interface serial0/1 on R3. It is going to remove 10.0.1.1/32 from its routing table since the next hop 172.16.13.1 (advertising router 10.0.1.1) is no longer available. It will still be available on R4 though. Even though R3 could have reached 10.0.1.1 through R1, it does NOT know the second path exists. The reason is, that current DR on Frame-Relay link is R4. This one cannot send LSA about 10.0.1.1/32 towards R3 since it has no layer 2 connectivity withR3! If you make R1 DR on the Frame-Relay link, R3 can reach 10.0.1.1 through its serial0/0 link). 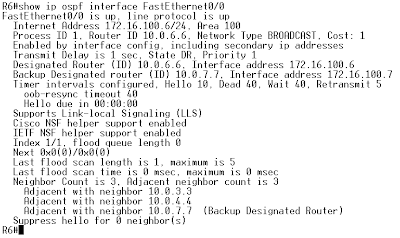 In the picture below, R1 is DR again, the R3's serial0/1 interface is still down (no OSPF neighbor there), but the connectivity to 10.0.1.1 is restored. This little study drill clear proves that in a hub-and-spoke topology, the DR should be the hub router. In order to avoid the situation that the spoke becomes the BDR, they should always be DROTHERs.